It was time for another trip with the geologists. My most avid reader(s) may recall a trip to Baja California about six months ago, or to the grand canyon, this time last year. These field trips are like a breath of fresh air and new ideas. This time, the trip had been timed and placed to coincide with the annular eclipse of May 20. Being my first eclipse, I was rather excited, and brought all manner of solar filters, cameras, tripods, binoculars, etc. We jumped in the tiny 9 seater extended expanded Ford Expedition and headed for the Owen's Valley, site or route of many previous adventures, as it is on the way to MOUNTAINS. First up was the Vasquez rock, once thought to be much more geologically interesting than it in fact is, but still rather tall and a good place for lunch and some mild bouldering exercises. After lunch we drove across the San Andreas fault, visible in the side of the road cutting as fabulously twisted strata. Set the steering wheel and take a snooze across the Mojave desert, through red rock canyon, and into the Owen's valley. At its head is a fossilised water/lava waterfall, caused by a series of eruptions moving the river around. Dry now for a long time, water carved hollows like Somersby Falls (inter alia) remain carved into the basalt. Again, set and forget as hours of your life vanish before getting to the top of the Owen's valley, where the road follows a water course (long dried up) through the Bishop ash deposits and up to the crater lake called Mono Lake. Many volcanoes in this region along a hot spot, though today the active part of the Cascades is far to the north, where various microplates are still being subducted under Washington state. California was obviously hungrier, because it's already finished. We stopped at the Mobil Station restaurant in Lee Vining, apparently set up by a celebrity chef escapee from San Francisco, and ate our reasonable fare looking out over Mono Lake and watching the sunset. We drove to the south to find our campsite, passing large patches of bare ground; the forest killed by gas seeping up from below. Won't sleep there! S and S and co had already set up a nice campfire for us, I located a cot bed, and spent a few minutes freezing my toes away from the fire to get a good look at Saturn's rings through my binoculars. After a few hours of fireside chat, I settled into my sleeping bag to sleep, watching a shooting star streak overhead as I did so. Unfortunately, my feet had already got so cold in the sub-zero temperatures that they didn't really warm up until the morning, which made for a cold, uncomfortable night. Next morning I woke up, dragged myself metaphorically kicking and screaming from the warmth towards some breakfast, packed the car, and drove down to Mono Lake's shoreline. Once the site of an army testing base, now a scrubby beach, the lake's falling level has exposed a large number of tufas formed by precipitation of calcium carbonate from fresh water springs below. Mono lake is much saltier than the ocean and has a pH of 10, making it inadvisable to drink. Surrounding the lake a few local mountains still had snow, which made for a pretty view. Next stop was Walker Lake, a remnant of a much larger lake, and even now, dropping more than 25m in a hundred years, since water diversions for irrigation. Formed by the usual half-graben process, it was possible to assess rates of fault slippage by examining the movement of alluvial fans down the valley as the shoreline receded. Also visible was a large 'bathtub ring' of deposits from a much older paleo-shoreline, far above the current road line. Similar deposits are also visible 11m above the present Salton Sea. We discussed whether it was miromictic (mixing layers once per year) or not, and the provenance of stromatolites on rocks around the shore. Since they had formed in MUCH deeper water, it was thought that they formed through inorganic accretion processes, though the area is still somewhat controversial. Like Mono Lake, it was also salty and alkaline, though not quite as much. Some fish were even present. One interesting thing I took away was that mobility of sediment is actually U shaped as a function of water velocity. Sand is the most mobile sediment. Larger pebbles, rocks, and boulders require faster water to move, which makes sense. But apparently smaller grains of silt, sediment, and clay stick together so well that they also require large water velocities to shift. This was an important point in understanding the progression of alluvial fans down the exposed valley. The deposit is rich enough that the metal can be seen in the rock, somewhat reminiscent of computer games. Dozens of cores have been drilled to assess the size of the claim. Then comes the fun part - how to get it out. Also present in the deposits are garnets, which are pretty cool. Garnets are rocks that formed near the surface, sunk into the mantle, then came back up. As a result, they've undergone chemical changes that enable study of the route they took. 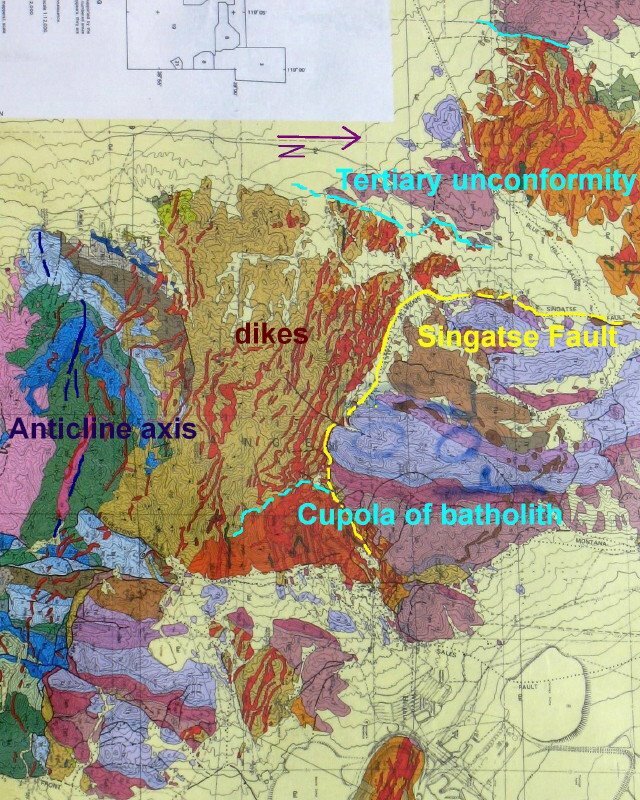 A transverse geological map of the area shows lots of sequential faulting associated with the land here (as in the rest of California and Nevada) being stretched by a factor of between four and six. (http://4.bp.blogspot.com/_zyAOnV8f3Oo/SAVEqpmGDRI/AAAAAAAAAfg/gGZsB83wH_A/s1600/IMG_3797_3_1.jpg) So one of the local geologists decided to take a digger and uncover one of these faults! We drove to the site and found the fault marked by a line of black rock about a cm thick! It slanted into the ground about 5 degrees from horizontal (which is pretty flat for a fault), and, it seems, has about a mile displacement between opposite faces of the fault. Given that a really big earthquake moves a fault by 2 metres, and such earthquakes only occur every hundred or thousand years, it would seem that the fault took between 100,000 and a million years to achieve its degree of displacement. But that's nothing on a geological scale. Plates move past each other at a rate of mm/year, and most of the continents have already performed at least one circumnavigation. Before long, the fault trench was filled with excited geologists! Next, our DJ started up a podcast called the Bugle, a satirical comedic current affairs radio show, which was highly amusing. On we drove to Lake Tahoe. We camped near Fallen Leaf Lake on the southern shore. A few brave souls went for a swim in the snow-melt-fed waters, while I contented my aging frame by skimming a couple of rocks. Later that night we sat around the campfire comparing the size of our head torches, shining lasers at smoke, and telling crazy stories from past field trips and/or quirky people in the department. Particular highlights included a recounting of the extremely wet experience in Baja last year, wherein everything washed away, including the road. Another story recounted the phantom of Arms building, sneaking into the fridge at the dead of night to eat other people's carefully stowed sandwiches, sometimes in front of them. At long last I found a place surrounded by plenty of undergrads to distract the bears, set up my stretcher, and went to sleep. This evening I had taken the precaution of warming my sleeping bag by the fire, so was toasty warm all night. Next morning we packed, I munched some stuff from my "Casey friendly food bag", and we drove north to Emerald Bay, where followed a walk to Eagle lake, several interesting talks about faulting in Lake Tahoe, earthquakes, tsunamis, seich waves, and glacial deposits in the area. It was particularly nice to sit by an idyllic lake nestled in a cirque and have someone point to a rocky outcrop hundreds of meters above and say "during the last glaciation, that arete was the only thing around here not covered in ice". On the way back we found several exposed rocks with striations left from glacial grinding. More exciting, perhaps, was reading the geological history of the granite's formation with the help of a few layers of partially broken mineral deposition, indicating that the rock was still moving when it was partially molten. We drove back to Nevada and north towards Genoa and the eponymous Genoa Fault, which was exposed at one point by an old gravel quarry. One of the most important faults (of a few dozen in the area), the Nevada/California stateline roughly demarcates the boundary between the North American Plate and the Sierra Microplate, which accounts for about a quarter of the 27mm/year difference between the pacific plate and the american plate. The remainder is taken up by the San Andreas fault. The difference in structure between the two regions is accounted for by the fact that the Sierra Microplate is moving about 7 degrees closer to the pacific plate, leading to compression in the west and extension in the east. It's also gradually tilting towards the pacific ocean. On the exposed face of the Genoa Fault, we searched for slickensides, or micro/macroscopic features which can be used to deduce the movement direction of the fault, something like scratches. While it was not too difficult to find evidence of normal faulting, this fault apparently used to also move in a right-lateral fashion, though I'm unclear if anyone was able to find evidence at this location. We noted with interest that the paleomagnetism vandals had struck here too, with 4 neat holes on a vein of pseudotachylite. This mineral fills fissures on fault faces and is formed by the pressure of a fault slip during an earthquake. Thus, if the earthquake can be dated, then the magnetic field at that place and time (wherever the rock was at that time) can also be determined, or vice versa. Next we drove out to Soda Lake, a much smaller version of Mono Lake in terms of water chemistry. Water table changes as a result of irrigation actually caused the level of Soda Lake to increase, and subsequent tufa formation on the shore occurred extremely rapidly, forcing theories of its formation to be reexamined. Meanwhile, the eclipse had started. I fitted the solar filters to my binoculars and got cracking with the timelapse. Unfortunately we then drove back to Fallon before finding a field somewhere to watch the rest of the event. As a result, my time lapse was somewhat stop-start, as a lot of the photos were taken out the window of a moving car. Since I returned I was able to process them somewhat to reveal the sequence more fully. Luckily, we stopped in time to hand out eclipse glasses etc and watch. It got quite dark, birds went to sleep, and trees cast very peculiar shadows, effectively forming a pinhole image. I gave my talk on eclipses, stalling to run out the clock on the time lapse as long as possible. During 'totality' (or 'annularity'), the moon was visible in perfect profile, and light could be seen shining through valleys on the surface. Before and after the eclipse, a couple of sunspots joined the party. It was my first solar eclipse and it was awesome! After that we drove west back to Reno, dropped someone at the airport, then proceeded to Stampede reservoir, near the north end of Lake Tahoe. To the relief of our desperate-to-pee driver, we arrived just in time. I headed down to the shore to make a time lapse of the stars rotating, then we once again set about burning things in the fire and eating a delicious dinner of pasta, once again magicked into existence by S and S.
Next morning we packed back into the cars and drove off. After stopping at the Donner Pass for a few talks on volcanism and an impromptu from me about cannibalism, we drove for about 10 hours down highway 5 all the way to Los Angeles. It was a VERY long way. Eventually we got back to Caltech, unpacked the cars, and headed off. I had more than a thousand photos to sort out!